One of the lectures I attended at SXSW Eco 2016 this year was called "1% Is Not Enough: Increasing Access To Organics" presented by Kashi Foods. One of the things I learned at the talk is that less than 1% of today's US farmland is organic. Less than 1%! That's terrible! I try to only buy organic foods as I know they are healthier, but sometimes it's hard as the selections are low and the prices are high. Now I know why. One of the main hurdles to farming organically is that it takes farmers 3 years to become USDA organic certified. Along the way there are many challenges they have to overcome such as new equipment they have to purchase, to the tons of paperwork required to stay transparent. The funds to implement can be enormous and for many farmers it's too cost prohibitive. Even though it's great for all of us to go organic it's often difficult for the farmers to make the transition due to a lack of immediate return on their huge investment. That is where Kashi has gotten involved. 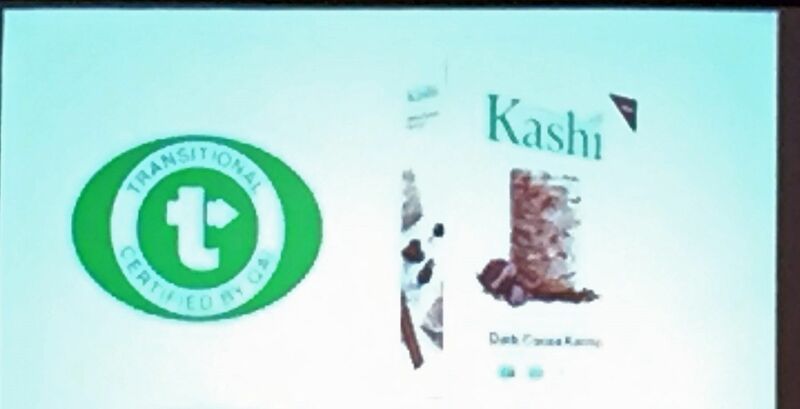 Kashi has partnered with Quality Assurance International (QAI) to create a "Certified Transitional Standard" for farmers wanting to transition to organic farming. This label symbolizes "goods produced at the highest standards during the framers transition to organic farming while paying them a fair wage". QAI certifies crops in transition making sure they are grown using sustainable processes and no GMO seeds. Farmers are also forbidden from using conventional pesticides on their crops. This CTS label stands for farms in the process of converting from conventional to organic farming certification. After 3 years of meeting the USDA's organic standards they can apply for organic certification. During this transitional period none of the crops can be sold on the organic market. Kashi is hopeful transitional farming will create a marketplace to drive more organic farmland in the US and will provide farmers greater financial stability. The easier it is to transition a farm to become organic the greater the chance they will. Kashi is walking their talk by working with two farms transitioning to organic farming. These farms are producing a new product for Kashi called "Dark Cocoa Karma" made from transitional wheat. They state on their website that "From now on this cereal will always be produced from transitional wheat farms". I have to say that I was very excited to hear this at the conference. I want everyone to go organic and for it to be affordable for all so I totally support this idea. Go local and support organics! For more info on transitional farming go to:www.Kashi.com.